π-Salt : Foods & drinks | IBE TECHNO CO.,LTD. 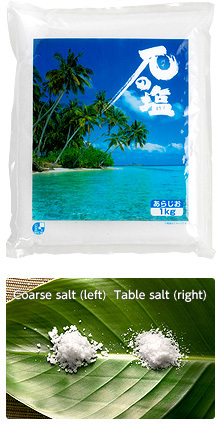 The raw materials are natural sea salt made by solar evaporation process and sea brine. Seaside underground water is used for the solution. Heat energy to crystal the salt is of firewood. Combined π-water system realizes the excellent completed salt with high energy. π-salt is definitely a salt but it is mild and even tastes sweet. Besides cooking, try for various purposes. Two kinds of salt are available. Please choose as your purposes.